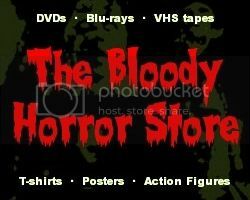 Dr Blood's Video Vault: What are your favourite horror movie snacks? What are your favourite horror movie snacks? One of the biggest culture shocks for me when I first arrived in America was the concessions stands in the local cinema. No, I'm not talking about the exorbitant price of things or even the giant buckets of coca-cola which should be humanly impossible to drink if you only have one bladder. What amazed me most was the amount of hot food available. Now call me old-fashioned but I have never seen a movie theatre with hotdogs and hamburgers being sold in it before. 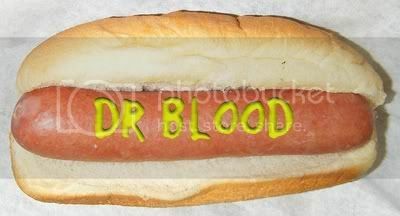 I still wonder how hungry you have to be that you can't go for an hour and a half without throwing a $10 hotdog down your neck. Personally, I'd rather wait until the film was over and I could go to a real restaurant or, at the very least. a cheaper one. Another thing which I find strange is the salted popcorn. In Britain, although salted popcorn is available, the majority of people go for sweet popcorn and, in particular, bags of Butterkist. Trying to find toffee popcorn in America has been a completely fruitless task and it's even more difficult than procuring back bacon rather than that overpriced streaky rubbish for my sandwiches. You know we throw that away in England, don't you? Anyway, since everybody's taste is different with preferred snacks ranging from M&Ms to beef jerky, I thought I'd go a bit more "interactive" for once and let you tell me what your favourite thing to eat is when you watch a horror movie. I don't want any of those feeble excuses about the gory scenes making you want to throw up or never eat again as I know you are all chowing down with the best of them during the most grisly disembowelments possible. You know that scene in "Hellbound: Hellraiser 2" where the skinless Julia first appears? Doesn't that make you want a juicy, dripping steak? Let me start you off. For ghostie films, I like as many bags of Walkers Cheese & Onion crisps as possible washed down with Tizer. For slasher films, it's got to be chocolate. For vampire films, I usually work my way through a big tin of cashews. So far I have never bought a hotdog or a hamburger to eat during a film as I always think that the smell of the things would be really annoying to other people. I've never actually seen anyone else eating them in a cinema either but I'm sure somebody does or they wouldn't have them for sale. What do you eat? Let me know in the comments below.